The new millennium, in which we are living, is in no kind comparable to the other precedent ones, as it has proved itself to be a rebel on all levels. Maybe its most striking characteristic, besides globalisation, is the technological advance which we have witnessed. “The technology (…) would have made Newton applaud, Tesla smile and Da Vinci giggle with glee.” (Cassela, 2010). This kind of advance aimed at making our lives easier; from GPSes, the most sophisticated satellites, smartphones to social networking sites, or at least that is what is advertised. This present study aims to define social media in general, being a special feature of the new millennium and an example or rather a consequence of this technological advance, to see how far the use of social media has met its already set goal and that is to facilitate communication and make boundaries just a myth. So what is meant by social media? This concept has been an umbrella term for almost all internet websites but specifically “social media are web-based communication tools that enable people to interact with each other by both sharing and consuming information” (Nations, 2018). Indeed, the number of social networking sites has exploded and so has that is of users; reaching 3 billion people, which amounts to 40% of the world’s population. (Brown, 2018). 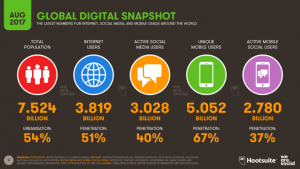 That said, more than one third of the world are online to socialize with their peers. However, the downside that has been steadily crawling is the fact that social media, which was supposed to boost communication and get people closer to each other, has changed the way people communicate and interact with one another. As much as social media has succeeded in bringing geographically distant people closer as much as it has made people, who are stone’s throw away, thousands of kilometres apart. We have all experienced sitting next to one another, bowing our heads down to our smartphones though- as if face to face communication has become old-fashioned- or seeing people walking with their phones or even worse driving while holding them. This constant and excessive checking habit of one’s smartphone is known as “the fear of missing out” (FOMO) (Griffiths, 2018). Basically, social media has dehumanized and turned us into a walking smombie[i]. For this matter and based on the humble readings and observations I made, I found it urgent to work on such a theme and investigate the question how the absence of social media does contribute to the re-humanization of communication and accordingly how would rethinking and prefigurating the use of social media impact our behaviour and relationships. Not only did I want to find answers to these quests, but also to discover whether the problem lies with us or with social media per se. To answer these questions, I engaged myself, along with two classmates, in a two-week self-experiment as a qualitative method to collect data and reach some results. 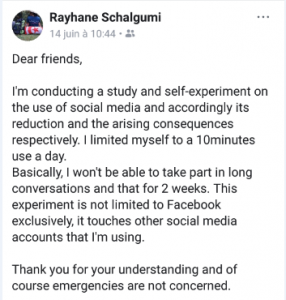 This experiment consisted in limiting my social media use to 10 minutes a day while taking notes of the possible changes, if any, to see the extent to which social media impedes real life communication and causes the dehumanization of people. The self-experiment is linked to the way I define social media independently from the above-mentioned or to any commonly used definition. My perception of social media is that this latter refer to any site through which I or one generally can virtually communicate with other people. In this way, I excluded you tube for example, being a helpful tool to study or to entertain myself while studying or cleaning the house. The present paper includes 3 parts. In the first one, I shall deal with healthy social media as a form of social movement and prefigurative politics. The second part is about the self-experiment per se and how this qualitative and subjective method has contributed to answering my main question. Reaching the last part, I will talk about the results. Healthy is not reserved to food solely; rather it goes beyond this category to reach any consumption in general. Consumption, yet, has to be always moderate and rational in order to not to turn into addiction. With this thought in mind, the consumption of social media is not any different from any consumption. Concerns have been raised about the excessive use or consumption of social media nowadays and how annoying or even dangerous the situation has become. Therefore, the motivation of this project is to rethink and prefigure the use of social media in such a ways as to pave the ground for a better interaction and participatory communication and not a call to abstain oneself from or boycott social media whatsoever. In this context, we can say that this rethinking and prefiguration can be better explained as a social movement and prefigurative politics. In order to better conceptualise and be able to understand this project at a societal level, it is imperative that I define these concepts. Even though there has not been any clear agreement on both definitions especially the latter, but social movement, according to Zald and McCarthy, is “a set of opinions and beliefs which represents preferences for changing some elements of the social structure and/or reward distribution of a society.” (1977, p.1217-18). By the same token, prefigurative politics refer to “a political orientation based on the premise that the ends a social movement achieves are fundamentally shaped by the means it employs, and that movements should therefore do their best to choose means that embody or “ prefigure” the kind of society they want to bring about.” (Leach, 2013, p.1). Taking these two definitions into consideration, healthy social media or in other words the moderate consumption of social media aim at a social change in a vanguardist and structural-reformist way, rather than revolutionary, to aspire, anticipate and “create the new society in the shell of the old”. (ibid.) This change yearns to a mentally healthy, politically active, critical thinking and humanly communicative society and that is through digital detox[ii] strategies and digital literacy and awareness. Ultimately, this change endeavours consciously using social media while maintaining the human-being status and with it the social life which does not necessarily dwell within nor take place in the bosom of social media sites. Maybe offline is the new online. Finding answers requires searching and digging deep for them, employing different methods to reach the first thread to the case. Like any case, I was striving to answer my focal question and I could not find a more suitable method to do so than experiencing it by myself. Of course, I am not belittling or underestimating other methods but for this study I was convinced that learning by doing makes it more authentic and enables me to get first hand information, despite the fact that self-experiments are considered to be subjective research methods and are not that comprehensive as the results can vary from one experiment to another. For the sake of this small project and in order to find answers, I conducted a two-week self-experiment where I limited my social media use to 10 minutes a day. I have even posted a status on Facebook explaining to my friends the reason why I would be almost inactive on social media in the determined period. 10 minutes a day to merely check news and quickly answer some messages without engaging myself in a long conversation. Through this experiment, I wanted to see how attached I am to social media and to also figure out how I can communicate with my peers outside the sphere of social media. Seeing that I do not consider myself dependent on this platform, I wanted to track down how would my friends, for example, try to reach and communicate with me anyway with the absence of social media especially that I am currently living abroad. 10 minutes to restore my faith in face to face and human communication, as this latter has been my main motivation to carry out this project. In fact, I was on the verge of believing that we are not able anymore to talk directly to one another, as the first question that pops in one’s mind when meeting a new person: “Do you have Facebook or Whatsapp…?” and this suppose to-be newly born acquaintance ends, in most cases, the moment one answers with No. It is not enough nowadays to have just a number to call, as one would feel outside the cast or be accused of introversion if he or she is not a member of a Facebook or Whatsapp group for instance. Thus, I was asking myself whether my friends would bother to call me or come by when I have chosen to be offline. I was fed up with how people, namely teenagers, are ignoring others in their geographical setting to focus on their phones. This is known as “Phubbing[i]” (Griffiths, 2018), which has destroyed social life. Social media use has had a spill over or rather a butterfly effect into other domains like health, mentality, maturity and also self-worth and self-esteem as people these days link their worth to the number of likes they get on Facebook or Instagram or to how much views they register on Snapchat. For all these reasons, I opted for stepping back from social media a little bit and observe closely. Two weeks are not a long period; they are a good test though to examine oneself and others in the age of social media and to diagnose the degree of digital awareness. Normally, the fruits which we reap are supposed to take a while after we sow them but this was not really my case when I first started the experiment. After posting on Facebook that I would be offline in the coming period because I am conducting a self-experiment on social media use, my friends welcomed this idea and they even blessed it. As aforementioned, I do not consider myself a social media-holic, thus I did not expect that big change when starting the experiment. In fact, other than consciously reducing the time spent on social media, I have learned how to be more selective when reading something. Of course, I only have 10 minutes to see what is going on in the world, hence I learnt how to benefit and invest in this short time to keep a pace with the news. Keeping in harmony with this idea, I spared myself the most typical social media feature and that is the famous scrolling up and down and refreshing. We all know and probably have experienced this up and down or what I chose to call “painting”. Moreover, I learnt that keeping a distance from social media is what makes us socially active with the world and inquisitive to reflect and read more and deeply because the headlines that we see in social media have made our reading and thus critical thinking skills, if any, very superficial. Even though my friends welcomed the idea of the project but to some extent they felt forced to reach me differently or rather conventionally. They knew that social media, even for a very determined period of time, is not option anymore so calling was the alternative to rescue, knowing that my friends, themselves, are not that much of social media users. In this way, a personal if not social movement was relatively reached through this small prefigurative act. Although I have not told my friends what they should do but my self-experiment has had like a domino effect since they took the first steps to reach me and by that I drew the conclusion that communication is there to stay when one wants it to. The biggest challenge, while conducting this experiment though, was the fact that I could not communicate with my family as long as we wanted to, especially that thousands of kilometres separate us. Basically, Whatsapp or Facebook calls are our safe haven to keep in touch because the regular call in our case would cost us a lot of money. Social media has been in this case nothing but advantageous and succeeded in bringing distant people indeed closer. This fact has answered my secondary question about who is to blame. Social media is not to blame, it is only a tool. Hence, the person’s use is what has created the problem. The human being has quickly lost control and proved him/herself weak in front of an instrument, which was supposed to serve the human being and not the other way around. It is a pity how people nowadays are more afraid on their smartphones more than they are on themselves or others. At the end of the project and with consensus with my two classmates who carried out the same study, we came to the conclusion that social media has nothing to do with re- or dehumanizing people. 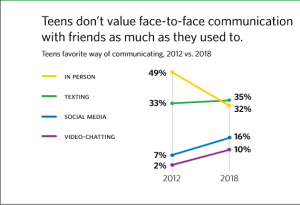 Similarly, the presence or absence of social media does not play any role in helping or hindering face to face communication. It is us who have the power to decide to value or disvalue anything so how social media can possibly exerts its toll if we were not the ones who gave it the permission. In summary, people need to reorder their priorities, revise and review their perception of social media. The question that is still open to further research is whether this contemporary addiction is spontaneous or part of a conspiracy game that people become social media unconscious users. 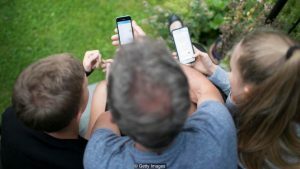 “a period of time during which a person refrains from using electronic devices such as smartphones or computers, regarded as an opportunity to reduce stress or focus on social interaction in the physical world”(Oxford Dictionary). Dieser Beitrag wurde am 17. Oktober 2018 von engagementforschungnrw in Präfigurative Politik veröffentlicht. Schlagworte: Initiative/Projekt, Selbstexperiment, Social Media.